gives a 3-year-old the chance to grow and explore for a whole month! Join our 2nd Annual Raise Heck Tug O'War - We are raising money for the Fledglings Scholarship Fund! Did you know that children today spend half as much time out of doors than we did as kids? Fledglings Nature-Based Preschool helps children connect to nature and become a life-long learner, and lover of our environment. Join us today in supporting this amazing cause! Will you help our Fledglings SOAR?!? 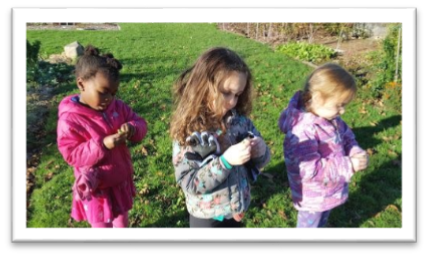 Help us raise $11,364 for the Fledglings Nature-Based Preschool Scholarship Fund to cover 100% of the requested aid for our 2018-2019 class of local 3-5-year-old learners. Fledglings Nature-Based preschool is a fully licensed educational program. We do our best to meet each family where they are - providing financial assistance to families in need while requiring each family to pay at least a portion of their child’s tuition. In one class this year, fully one-third of the students received some level of assistance from the Fledglings Preschool Scholarship Fund. $11,364 in scholarship funds have been requested by our 2018-2019 Fledglings class. Your Support allows us to help more children build connections with nature. Have you ever seen a child build a fort out of sticks and branches!? Or discover that carrots GROW in the ground?! Have you watched your own children or grandchildren explore ice - the way it fractures and cracks, or how slippery it is! These moments of DISCOVERY are what Prescott Farm and our Fledglings Nature-Based Preschool are all about! Children learn best through play and learn more when they are interested in the topics at hand. Everything is interesting when it’s connected to the places you have walked, sights you have seen and things you have smelled! When children have the opportunity to use the great outdoors for their exploration, it stimulates the imagination, fosters a sense of belonging, and helps young children become better problem solvers, engineers, artists, and future inventors. Prescott Farm –exploring and preserving the natural world, one adventure at a time. Prescott Farm is a 501c3 nonprofit organization dedicated to environmental education and preservation. We offer programs for all ages and a place in the Lakes Region community that encourages curiosity, discovery, fun, and connection to the natural world, year round. Prescott Farm throws open the doors that keep people inside and uses hands-on education to teach you about the wonders of the world around you, making meaningful connections to nature & wildlife, food & gardening, and NH crafts & customs. Unplug, relax, and connect with nature! Prescott Farm is designated as an official NH Wildlife Viewing area with 160 acres of conservation lands open to the public year-round. Our innovative Samuel P. Pardoe Buildings is open Monday thru Saturday, 9am – 4pm, with displays, information and restrooms for visitors, although the trails themselves are open 365 days per year, from dawn to dusk. Visitors can play in our Natural Playscape, learn about native plant and wildlife species, and explore at their own pace in our heritage gardens and along more than three miles of woodland, pond and field trails with views of Lake Winnipesaukee and the Belknap Mountains; or engage with our experienced naturalists through public programs for all ages, WildQuest Camps, or Fledglings Nature-based Preschool. For more information about joining the Raise Heck Tug O'War with a team of your own, contact Lissa Mascio, Development & Communications Director, at LMascio@prescottfarm.org or (603) 366-5695. Prescott Farm is a nonprofit organization dedicated to environmental education and preservation. We provide year-round environmental education programs for all ages and a place in the Lakes Region community that encourages curiosity, discovery, fun and connection to the natural world. Founded in 1997 as Prescott Conservancy, Inc. d/b/a Prescott Farm Environmental Education Center, Prescott Farm has helped awaken appreciation for nature and concern for the environment in thousands of program participants. We offer a wide range of programs designed to preserve and pass down knowledge and skills that encourage an understanding of the natural systems that sustain us all and respect for the environment. During the summer and school vacation weeks, our environmentally-themed WildQuest Camps have offered children ages 6-12 the opportunity to explore, learn, and grow in nature for over 15 years. Since 2015 our nature-based preschool, Fledglings Preschool at Prescott Farm, has offered children ages 3 to 5 the educational foundation they need to succeed in school while awakening in each child a natural curiosity and respect for nature which is at the core of every preschool lesson. Unplug, relax, and connect with nature! Prescott Farm is designated as an official NH Wildlife Viewing area with 160 acres of conservation lands open to the public year-round. Visitors can play in our natural Playscape, learn about native plant and wildlife species, and explore at their own pace in our heritage gardens and along more than three miles of woodland, pond and field trails with views of Lake Winnipesaukee and the Belknap Mountains.